شاملو, شبنم, نقی‌زاده, محمد, حبیب, فرح. (1397). واکاوی رویکردها و زمینه‌های نظری و تدوین چارچوب مفهومی منظر شهر. معماری و شهرسازی آرمان شهر, 11(23), 197-209. شبنم شاملو; محمد نقی‌زاده; فرح حبیب. "واکاوی رویکردها و زمینه‌های نظری و تدوین چارچوب مفهومی منظر شهر". معماری و شهرسازی آرمان شهر, 11, 23, 1397, 197-209. شاملو, شبنم, نقی‌زاده, محمد, حبیب, فرح. (1397). 'واکاوی رویکردها و زمینه‌های نظری و تدوین چارچوب مفهومی منظر شهر', معماری و شهرسازی آرمان شهر, 11(23), pp. 197-209. شاملو, شبنم, نقی‌زاده, محمد, حبیب, فرح. واکاوی رویکردها و زمینه‌های نظری و تدوین چارچوب مفهومی منظر شهر. معماری و شهرسازی آرمان شهر, 1397; 11(23): 197-209. 1دکتری شهرسازی، دانشکده هنر و معماری، دانشگاه آزاد اسلامی، واحد علوم و تحقیقات، تهران، ایران. 2استادیار شهرسازی، دانشکده هنر و معماری، دانشگاه آزاد اسلامی، واحد علوم و تحقیقات، تهران، ایران. 3دانشیار معماری، دانشکده هنر و معماری، دانشگاه آزاد اسلامی، واحد علوم و تحقیقات، تهران، ایران. منظر شهر و ادبیات مربوط به آن که نقش مؤثری در زمینه ارتقای کیفیت محیط در فضاها و عرصه‌های عمومی شهرهای امروزی ایفا می‌نماید، در طی قرن گذشته و در آستانه هزاره سوم به‌طور بی‌سابقه‌ای گسترش یافته و مورد توجه جدی معماران منظر، طراحان و برنامه‌ریزان شهری قرار گرفته است. در این میان، نظریه‌پردازان گوناگون با رویکردهای متفاوتی این موضوع را مورد بحث و بررسی قرار‌داده‌اند. در پژوهش حاضر به‌منظور ارزیابی و تدقیق نظرات مطرح‌ترین متفکران مرتبط با منظر شهر و تدوین چارچوب مفهومی منظر شهر، به روش مطالعه اسنادی و با استفاده از متون واجد ارزش در این عرصه، ضمن بررسی تعاریف و مفاهیم منظر شهر؛ نوین‌ترین ایده‌ها، نظریه‌پردازان، نظریات و بحث‌های کلیدی و دیدگاه‌های آنان راجع به منظر شهر به همراه بیان مکانیزم طبقه‌بندی و چارچوب گونه‌شناسی رویکردها برای اولین بار در قالب چهار دوره زمانی عمده تدوین شده است. این دوره‌های زمانی که از انقلاب صنعتی تا جنبش منظر شهر (1960)، جنبش منظر شهر تا جنبش نوشهرسازی (1960ـ1990)، جنبش نوشهرسازی تا جنبش شهرسازی منظر (1990ـ 1997) و جنبش شهرسازی منظر تاکنون (1997ـ2014) را شامل می‌شوند، به تفکیک در پنج محور زیباشناختی؛ زمینه‌گرایی شامل ادراک فضایی ـ بصری، ادراک بصری ‌ـ رفتاری؛ نوشهرسازی، توسعه نوسنتی بافت‌ها و مناطق شهری؛ شهرسازی منظر و شهرسازی اکولوژیکی همراه با مؤلفه‌های رایج در هر دوره ارائه شده است. همچنین در راستای تدوین چارچوب مفهومی و زمینه‌های نظری منظر شهر به واکاوی آرای 23 صاحب‌نظر در عرصه منظر شهر پرداخته و مهم‌ترین ابعاد و شاخص‌های منظر شهر از نظر آنان شناسایی شده است. Appleyard, D. (1976). Planning a Pluralistic City. Cambridge: The MIT Press. Appleyard, D., Lynch, K., & Myer J.R. (1964). The View from the Road. Cambridge: The MIT Press. Boone, Ch., & Modarres, A. (2009). City and Environment. (M. Tabibian, Trans.). Tehran: Tehran University Co.
Carmona, M., Heath, T., Oc, T., & Tiesdell, S. (2003). Public Places-Urban Spaces: The Dimensions of Urban Design. London: Architectural Press. Caves, Roger W. (2005). Encyclopedia of the City. New York: Routledge. Corner, J. (2006). Terra Fluxus. The Landscape Urbanism Reader, Charles Waldheim, (Ed); New York: Princeton Architectural Press, 21-33. Cullen, G. (2003). The Concise Townscape. (M. Tabibian, Trans.). Tehran: Tehran University Co.
Cullen, G. (2007). Townscape: Introduction. Urban Design Reader, Matthew Carmona and Steve Tiesdell, (Ed); Oxford: Architectural Press. Duany, A. (2003). Neighborhood Design in Practice. Urban Villages and the Making of Communities, Peter Neal (Ed); London: Spon Press. Duany, A., & Plater-Zyberk, E. (2002). The Lexicon of New Urbanism. Version 3.2, Miami: DPZ & Co.
Duncan, A. (2010). Landscape Urbanism: An Annotated Bibliography. Unpublished Dissertation, PhD Candidate, Toulan School of Urban Studies and Planning, Portland State University, 1-2. Easterling, K. (2003). Error in Landscape Urbanism. A Manual for the Machinic Landscape, M. Mostafavi and C. Najle (Eds); London: Architectural Association, 154. Faizi, M. (2010). Urbanscape, Comparative Study of Three Concepts in the City. Manzar, 2(9), 36-37. Faizi, M., & Razzaghiasl, S. (2008). Landscape Urbanism: A New Approach in Landscape Architecture & Urban Design. Gehl, J. (2002). Public Spaces and Public Life. Adelaide: Adelaide City Council Press. Gray, C. (2005). From Emergence to Divergence: Modes of Landscape Urbanism. Unpublished Master Thesis, University of Edinburgh. Hillier, B. (2004). Designing Safer Streets: An Evidence-Based Approach. Planning in London, 48, 45-49. Hillier, B. (2007). Space is the Machine, A Configurational Theory of Architecture. Space Syntax. Hillier, B., & Hanson, J. (1984). The Social Logic of Space. New York: Cambridge University Press. Hillier, B., Penn, A., Hanson, J., Grajews ki, T., & Xu, J. (1993). Natural Movement: Or, Configuration and Attraction in Urban Pedestrian Movement. Environment and Planning B: Planning and Design, 20, 29-66. Katz, P. (1994). The New Urbanism: Toward an Architecture of Community. New York: McGraw-Hill Professional. Krier, R. (1996). Stadtraum in Theorie und Praxis. (Kh. Hasheminejad, Trans.). 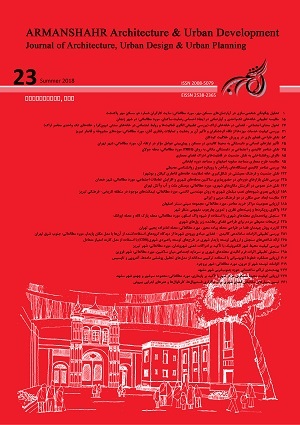 Tehran: Jahad Daneshgahi Co.
Lang, J. (2004). Creating Architectural Theory: The Role of the Behavioral Sciences in Environmental Design. (A. Einifar, Trans.). Tehran: Tehran University Co.
Lindholm, G. (2008). Landscape Urbanism – Large-Scale Architecture, Ecological Urban Planning or a Designerly Research Policy. Accepted Paper for NAAR Annual Symposium, Gothenburg. Lindholm, G. (2011). Visible gestures: On Urban Landscape Perspectives in Planning. Planning Theory, 11(1), 5-19. Lynch, K. (2002). The Image of the City. (M. Mozayeni, Trans.). Tehran: Tehran University Co.
Mossop, E. (2006). Landscape of Infrastructure. The Landscape Urbanism Reader, Charles Waldheim, (Ed); New York: Princeton Architectural Press. Mostafavi, M., & Doherty, G. (Eds), (2010). Ecological Urbanism. Basel: Lars Müller Publishers, 17-50. Motloch, J. (2002). Introduction to Landscape Design. Tehran: Parks & Green Space Organization of Tehran. Parolek, D., Parolek, K., & Crawford, P. (2008). Form-Based CODES: a Guide for Planners, Urban Designers, Municipalities, and Developeres. Hoboken, NJ: John Wiley & Sons, Inc.
Plater-Zyberk, E., & Donnelly B. (2010). New Urbanism. Encyclopedia of Urban Studies, Ray Hutchison, (Ed); Sage Publication. Reed, C. (2006). Public Works Practice. The Landscape Urbanism Reader, Charles Waldheim, (Ed), New York: Princeton Architectural Press, 280. Rossi, A. (1982). The Architecture of the City. Cambridge: The MIT Press. Sitte, C. (2006). City Planning According to Artistic Principles. (F. Gharib, Trans.). Tehran: Tehran University Co.
Spirn, A.W. (2011). Ecological Urbanism. Companion to Urban Design, Tridib Banerjee and Anastasia Loukaitou-Sideris (Ed); UK: Taylor & Francis e-Library. Steiner, F. (2011). Landscape Ecological Urbanism: Origins and Trajectories. Landscape and Urban Planning, 100(4), 333-337. Tibbalds, F. (1992). Making People-Friendly Towns: Improving the Public Environment in Towns and Cities. Spon Press. Trancik, R. (1986). Finding Lost Spaces: Theories of Urban Design. New York: Van Nostrand Reinhold Co.
Waldheim, Ch. (2006). Landscape as Urbanism. The Landscape Urbanism Reader, Charles Waldheim, (Ed); New York: Princeton Architectural Press, 38. Weller, R. (2006). An Art of Instrumentality: Thinking Through Landscape Urbanism. The Landscape Urbanism Reader, Charles Waldheim, (Ed); New York: Princeton Architectural Press, 44.